Drunk driving law in Georgia is shrouded by myths, misconceptions, and old wives’ tales. About 90% of people facing an arrest for a DUI first offense in Georgia make costly errors while being investigated and after their arrest, and often their mistakes (e.g., not complying with the Georgia implied consent law) can lead to a conviction for drunken driving. This leads to an implied consent “refusal” under the GA implied consent law, and very harsh consequences to a person’s driving privileges can occur. This is when you need a DUI lawyer in Georgia who is the best in the business. Any experienced GA DUI attorney will tell you that field sobriety tests are complete horse manure. The police GRADE you on a scale that 2 minor glitches out of over 122 possible errors is a FAIL (one leg stand field sobriety test). Then when the confused citizen gets arrested anyway, they think, “I’m not going to take the breath test or blood test.” HUGE ERROR. Refusing to take a field sobriety test (or ALL sobriety tests BEFORE being arrested) carries NO penalty, or loss of license. AFTER being arrested for DUI less safe, refusing to take the Georgia implied consent law test requested by the officer can suspend your drivers license for a FULL YEAR. 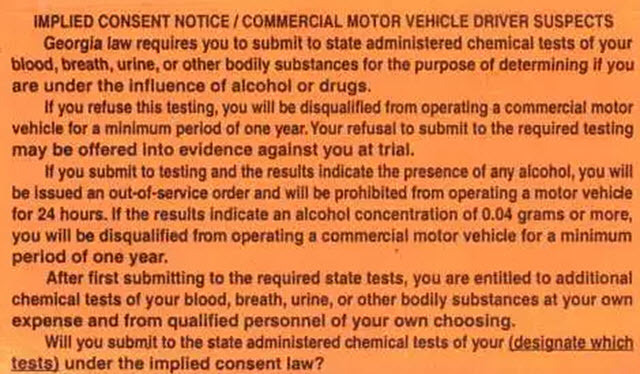 This leads to an implied consent “refusal” under the GA implied consent law, which triggers an administrative license suspension that can BLOCK ALL DRIVING for a full year. Plus, by refusing the Georgia implied consent law test (usually a breath alcohol test), you cannot demand and receive your own independent test of your blood. So, by not knowing and exercising your legal right, very harsh consequences to a person’s driving privileges can occur. Even if you do not take ANY roadside tests, and refused the GA implied consent breathalyzer, you will still be charged with DUI less safe, on such things as smelling like alcohol, having red, bloodshot eyes, having difficulty puling your driver’s license out of a wallet or purse and some minor traffic violation, like failure to maintain lane. This is when you need a DUI lawyer in Georgia who is the best Atlanta DUI Lawyer in the business, call Bubba Head. “The evidence presented by the State was sufficient for any rational trier of fact to find Jaffray guilty of DUI less safe beyond a reasonable doubt. Jaffray’s consumption of alcohol was established by his own testimony, the positive result from the alco-sensor test [hand-held, portable breathalyzer], evidence that his BAC was between 0.073 and 0.085 an hour after the incident, the smell of alcohol emanating from Jaffray, and his watery and bloodshot eyes. Police in GA can AND will charge you with DUI alcohol less safe EVEN if you refuse to be tested on an Intoxilyzer 9000 alcohol breath tester after you are arrested for driving under the influence of alcohol. So, while the prosecutor in your case will not have breathalyzer test for alcohol level or blood alcohol test results that are over “over the legal limit” to support a possible criminal charge of DUI alcohol per se, you can be convicted of driving while intoxicated or DUI. Which DUI lawyer in Atlanta can tell me how to get out of a DUI in court? Read further to learn how to beat a DUI involving alcohol – if you know your legal rights. Although Georgia DUI laws are among the harshest in America for loss of license for an implied consent “refusal” to be tested (one year loss of ALL driving privileges), your DUI lawyer has a better chance of winning your DUI case at trial, when no “over the limit” DUI alcohol charge is part of the case. Talking. Shut up! Only your name and address are required. Nothing further. Admitting to drinking OR any type of alcohol consumption. The same rule applies to drivers who have had no alcohol, but have smoked marijuana or taken prescribed drugs. Shut up! See number 1 above. Submitting to ANY roadside “tests.” Don’t let an officer check your eyes, have you walk a line, stand on one leg, perform any type of alphabet test, or attempt any type of counting test. Shut up! Just shake your head to indicate NO, or say, “No, thank you.” See number 1 above. IF THE GEORGIA IMPLIED CONSENT notice has been read to you as part of your DUI arrest, refusing to submit to a state-administered breath test under the Georgia implied consent law CAN suspend your driving privileges with NO WORK PERMIT for a full year. This decision to not say “YES” can cost you the ABILITY TO DRIVE in Georgia for a full year. No work permit can be issued if you lose the administrative license suspension hearing, so hire the best GA DUI lawyer possible to fight this. 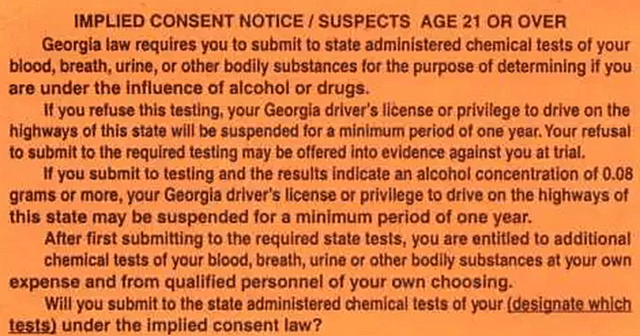 To top that, since 2006, Georgia passed a DUI law that permits an officer who has been told “NO” to submitting to the implied consent test required by Georgia law, to apply for and get a SEARCH WARRANT for getting a blood sample. Then you have to face the blood alcohol results, and possibly be FULLY suspended from driving for a YEAR. Plus, if the police have evidence that you refused the implied consent test, this fact CAN be used against you in your criminal case for DUI less safe. SPECIAL ADVISEMENT: Even more important may be the fact that in Georgia, refusal of the officer’s requested test means that you GIVE UP YOUR RIGHT to an independent test of your own choosing, and at your own expense. 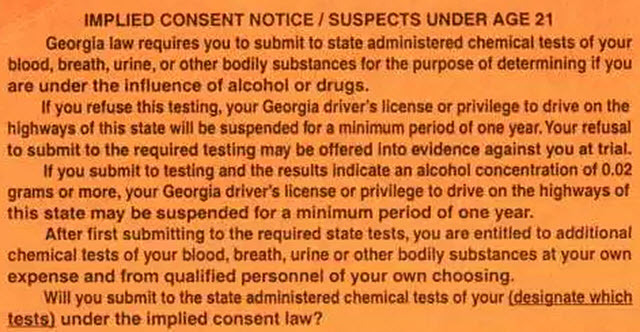 While Georgia DUI laws and reported DUI appeal cases are very protective of your right to an independent test or tests, you have to first take the requested police “chemical test” of your breath to be eligible to be assisted in obtaining your own independent test or tests of your WHOLE BLOOD, and have it tested for ethanol (alcohol) only. IMPORTANT: Tell the officer that you want your independent test at “ ___________ Hospital”, after he or she has given your breath alcohol test. Select a hospital in a nearby county (not the one you are in), because GA implied consent law says YOU get to pick where your test is taken. Be prepared to PAY for your blood to be collected. An officer must let you get money from an ATM or get a friend or family member to bring cash for your independent test. Demanding to speak to a DUI attorney before taking the GA implied consent test. The Georgia Supreme Court has decided that NO SUCH RIGHT to legal counsel exists in Georgia, before taking the implied consent test, so this is a failed strategy. Other reported Georgia DUI law appeals indicate that insisting on having a DUI lawyer present or being able to TALK with a DUI lawyer for advice, before agreeing to any breath test or blood test, CONSTITUTES A REFUSAL. See number 4 above about these DUI consequences. Plus, you will still have to face trial for DUI less safe alcohol. Insisting on only taking a BLOOD test, and not a breathalyzer test, which the police officer is seeking. While some states do let you opt for blood and not breath (California), Georgia does not permit a detained DUI driver in Georgia to make this choice. Your adamant insistence on only a BLOOD test will again be deemed a REFUSAL. The prosecutor will seek a conviction for DUI less safe. Harsh additional DUI penalties and consequences for refusal to submit follow any refusal of the requested implied consent test in Georgia. See number 4 above. Deciding to not respond to a police officer’s request for the implied consent breath test. Georgia appellate case law indicates that IF a suspended DUI driver refuses to agree (by either NODDING an affirmative answer or saying “YES,” then THIS CONDUCT can be deemed to be a refusal, carrying the same DRACONIAN loss of license for a full year (and other disadvantages) as identified in number 4 above. The bottom line is that NOT taking the state-administered test, as requested by police, can cost you the right to drive. A new Georgia DUI law, HB205 (enacted at the 2016 Legislative Session), allows a driver who has “refused” to comply with Georgia’s implied consent laws to install an ignition interlock device and pay for monthly data downloads for a full year. HB205 only takes effect July 1st 2017. Even then, the cost of such added equipment is going to be several thousand dollars ($3,600 – $4,500) depending on the sophistication of your vehicle and difficulty of installation. How embarrassing will it be to have to BLOW into a tube to start your car for a full 365 days? Who is the Georgia DUI lawyer who wrote the book on Georgia DUI laws to educate other lawyers on how to avoid a DUI Georgia conviction? Call Atlanta DUI lawyer Bubba Head or his law partners and get more helpful FREE information than from ANY other law firm. Our job is to help you find a way to avoid a DUI Georgia conviction on your permanent criminal record that remains there for life! Call him at 1-888-DUI-HEAD [1-888-384-4323] or email bubba@bubbahead.com to start a thorough review of ways to beat a DUI charge. For 40 years, he has been able to deliver excellent results to more clients than any other attorney in Georgia. William C. “Bubba” Head, Board Certified in DUI defense (one of only 4 attorneys in the State of Georgia) – A veteran DUI attorney with 40 years of aggressive criminal defense experience, and over 200 appellate cases to his credit, has been a nationally-known DUI book author for the last 25 years. As mentioned above, Mr. Head also originally wrote, and still is co-author of the #1 legal treatise on Georgia DUI law for over 20 years. As far as lawyer ratings, William C. Head has held the highest ethical rating, and highest practice competence rating (5.0 of 5.0) from Martindale-Hubbell for over two decades. Even rarer, this veteran DUI lawyer is one of only 4 Board Certified GA DUI attorneys, and has been named for expertise for his DUI law specialty in the ultra-exclusive Best Lawyers in America directory longer than any other Georgia criminal defense lawyer. Mr. Head also has been honored TWICE with the BestLawyers.com DUI attorney of the year recognition in Georgia for 2012 and 2017. This DUI lawyer in Atlanta has been consistently named to the list of Georgia Super Lawyers EACH year (2004 to 2017) since these lawyer ratings were started, a top distinction that only one other Georgia attorney (out of nearly 40,000 GA attorneys) has achieved. Another totally unique attorney rating qualification, for the entire United States, is that in July of 2003, Mr. Head was voted to be the best DUI-DWI attorney in America, by the members of the largest drunk driving defense lawyer group in the country, NCDD.com. Cory E. Yager, Georgia DUI lawyer, in his 9th year as a criminal justice attorney, after 9 ½ years as a Georgia police officer. Mr. Yager began his career as a Cobb County police officer, patrolling all of Atlanta and Cobb County, before transferring to the Roswell Police Department, so that he could get a regular duty schedule and continue going to law school. Mr. Yager has been named as a “Super Lawyers Rising Star” for the past 5 years straight. Mr. Yager has won two GA statewide quality awards from a private “think tank” DUI defense group of nearly 100 DUI lawyers, for being the “Best DUI Defense Attorney Negotiator” in the State. This prestigious award is only given to lawyers whose primary law practice is for DUI alcohol and DUI drugs cases in Georgia. Maurice H. Hilliard, Jr., Georgia lawyer for 58 years, with 33 as a criminal court judge. Mr. Hilliard’s attorney review is 10.0 with AVVO. Mickey Roberts, Georgia attorney for 36 years, and over 10 years serving as a part-time drunk driving municipal court judge in two different GA cities. His attorney review is also a 10.0 with AVVO. Call Atlanta DUI lawyer Bubba Head or one of his top-rated law partners today at 1-888-384-4323 (1-888-DUI-HEAD) and put 40 years of successful DUI defense on your side. Mr. Head is a 24-hour lawyer for your Atlanta case. His criminal defense law office provides you with a FREE DUI case evaluation whatever time of day or night you call – weekends and all holidays, too. William C. (Bubba) Head, Criminal Defense Attorney Atlanta, has been a Life Member of both NACDL (National Association of Criminal Defense Lawyers) and GACDL (Georgia Association of Criminal Defense Lawyers) for over two decades. The Atlanta DUI attorney is recognized by the ABA as a DUI lawyer, as one of only 4 criminal defense attorneys in all of Georgia to be Board-Certified in DUI Defense.